On September 17th, 2012 Christian and Karen Boros opened a second exhibition featuring works from their extensive art collection to the public. The couple have owned a WWII bunker in Berlin, where a large selection of their collection is on display, since 2003. The building went through a renovation process and opened its doors in 2008 with the first Boros Collection. Now each of the 80 rooms in the space have been transformed, revealing a new array of works from various artists. Entering the bunker is quite an experience on it’s own. The structure is large and overbearing. The thick concrete walls, once used to protect civilians seeking shelter, now house contemporary artworks ranging in date from the early 90s to present. In Boros Collection #2, now on view, the selection shifts between photography, sound installation, sculpture, and painting. Those who have visited the previous exhibition, may find this one to be darker in nature, a bit moodier and even melancholic. Some of the works are large and encompass the space almost awkwardly. Other rooms are almost empty and not in a way that feels minimalistic, but rather disproportionate space distribution. A few favorites and pieces worth mentioning are by Klara Lidén and Wolfgang Tillmans. Many works by Swedish artist Klara Lidén are now on view as part of this recently revealed collection. However of these pieces, which fill various positions in the bunker, Teenage Room, 2009 steals the show. In an enclosed space that feels as if it was transported into the bunker from another time period, rather than WWII era closer to the pop 1990s, the walls are white (versus otherwise untouched, concrete) and a plush carpet, already showing some wear from cobblestone Berlin streets, has been installed on the floor. The room features a crafted bunk bed that appears to function almost as a fort or hideout rather than a place to sleep. A quilted blanket made of denim squares, is stretched across where the mattress should be making what feels like a cot or hammock. The wooden structure has been spray painted black, some of which has ended up on the nearby wall. Opposite the bed is a small escape hatch. The shape has been cut through the thick concrete and has a small, functioning little white door. The hatch corresponds with the entrance (or exit for whomever feels trapped inside), an average size door but connected by rope, to a dangling ax. The swinging ax rises and lowers as the door opens and closes. It allows one to imagine that with one boisterous, swift swing of the door someone will get their head cut off. I like Klara Lidén’s work because she taps into an unbridled youthfulness. Her work captures the visual aesthetic of circumstances filled with hideouts, building forts in the woods, mapping out escape routes and taking the long way home, but with a dark twist. Several of the photographs by Berlin based artist Wolfgang Tillmans also capture and portray youthful playfulness. Over the years he has photographed many of his friends Lutz and Alex, who appear and reappear in numerous photos, in moments that range from tree climbing. His other works are rather direct portraits of youth in and around the city or hanging out in their respective kitchens. Many of the photographs feature a moment that seems to be frozen in a void separate from specific time identification although distinct by fashion choices. One of his most striking photographs and what appears to be a direct reference to WWII and therein the bunker in which it hangs is Tillmans’ Lutz, Alex, Suzanne & Christoph (b/w), from 1993. The photo features the friends curled up, dressed in camoflage, shot from above in a circular position at the beach. 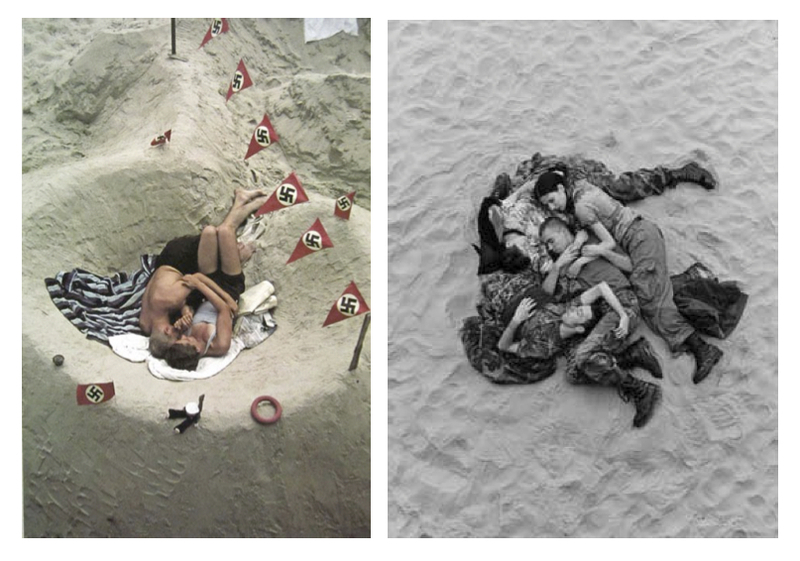 The placement of the bodies and point of view of the photographer, reminds me of a small photograph that hangs in The Documentation Center of the Topography of Terror in Berlin. I wrote about the original image previously (article titled Ein Foto von einem Fotograf) because it is so striking and intimate, a calm before the storm. Seeing Tillmans referential photograph in the Bunker is both a reminder of the past and also offers respite in acknowledgement of the present. Christian and Karen Boros open their private collection to the public by appointment only. This and the previous works that were on display in Boros Collection #1, offer a chance not only to view many museum quality works of art in person, but also experience a part of German history that has stood the test of time and now rather than offer a place to hide, is a venue for looking at contemporary art and expanding the possibilities of ones’ mind. Other artists in the collection include Tomas Saraceno, Michael Sailstorfer, Thomas Ruff, Florian Meisenberg, Alicja Kwade and others. Stay tuned for my interview with Christian Boros in the next issue of Artvoices Magazine.